Worse still, APP refers to the brand as “fully sustainable” (hence the cartoon) and “100% made in the USA”. 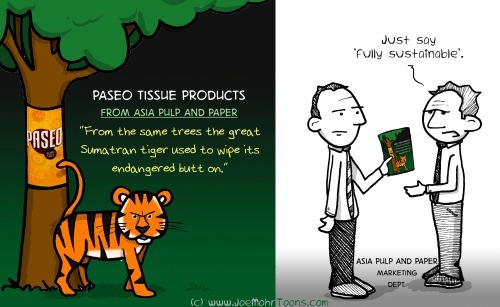 To help Greenpeace help the rainforests you can sign a petition to tell stores to stop selling the “fastest growing bath tissue brand“. You can also become a rainforest activist by taking the Paradise Forests Defenders Pledge. The rainforests are worth it!